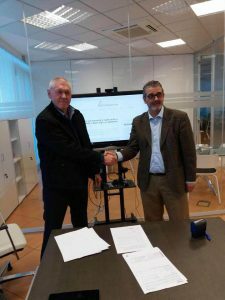 [:en]CDI Systems and Innovación y Cualificación, a company based in Spain, sign a JV agreement. [:] – CDI Systems Ltd. The business objective of the JV is to jointly set up a new website in Spain for the distribution and sales of digital, printed, and POD (Print on Demand) books, based on CDI’s NetIS technology. The new website will operate under the brand www.peterbooks.com and is expected to be released in April 2018. According to the agreement, Innovación y Cualificación will be responsible for all the marketing aspects & providing the content (books), CDI will be responsible for all the technology aspects, including the integration with the POD service provided by Podiprint (a sister company of Innovación y Cualificación). The companies estimate that a minimum of 100.000 titles will be uploaded towards the first release and is expected to grow to 500,000 titles within the first year of operation. Mr. Miguel Angel Sanchez Maza – Innovación y Cualificación´s CEO: “I am confident that the combination of CDI Systems’ innovative technology with our rich experience in POD and marketing capabilities, will pave the way to transform www.peterbooks.com into a prominent player in the books/ebooks marketplace”. Mr. Itzhak Levit – CDI Systems’ CEO “in the course of 2016 we participated in Liber, the benchmark event in the Spanish language book sector, our main goal was to find a local partner to introduce our technology into the Spanish market. We met with Innovación y Cualificación team and the excellent synergy and chemistry was there from day one. I am confident that this initiative will be a great success for all, the partners and consumers”.